Beautiful tea, a perfect view, and a trained staff do not always equal a good tea experience. 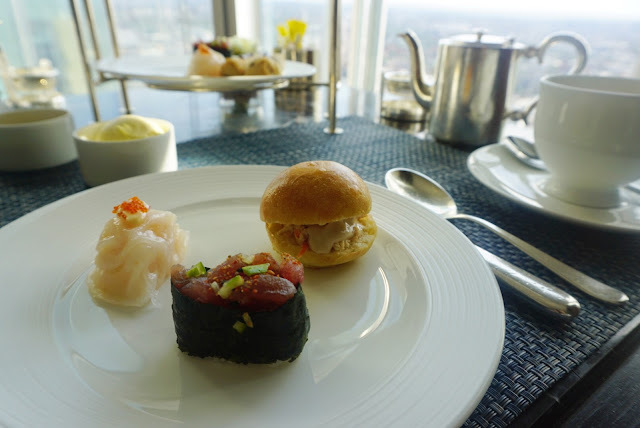 This is what I learned at the second afternoon tea I had in London, at the Shangri-La hotel. The hotel is in The Shard, which is an imposing glass building. It's a strange experience to be whisked up 35 floors to an immaculately decorated hotel. This isn't uncommon in NYC, but every time I do it, it feels a bit surreal. The hotel is lavish yet tasteful. Afternoon tea is served at Ting, the hotel lounge and restaurant. 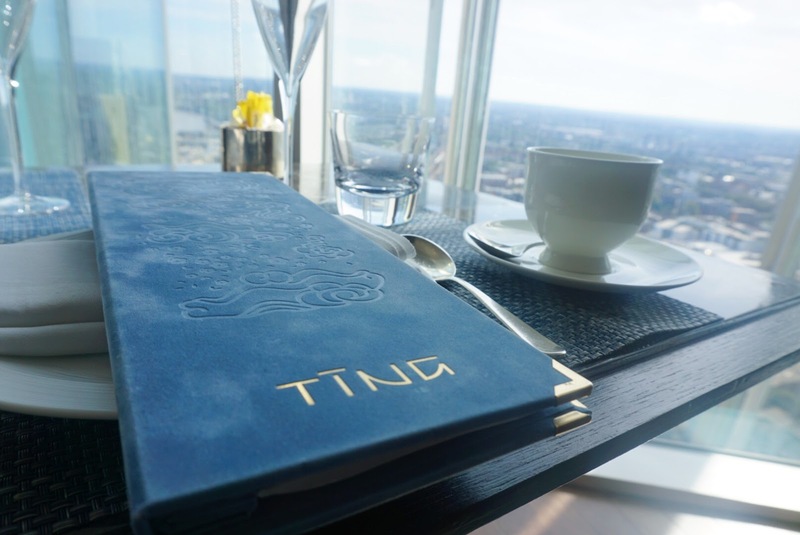 We were sat by the wall of windows with a dazzling view of London. Quite an impressive start. 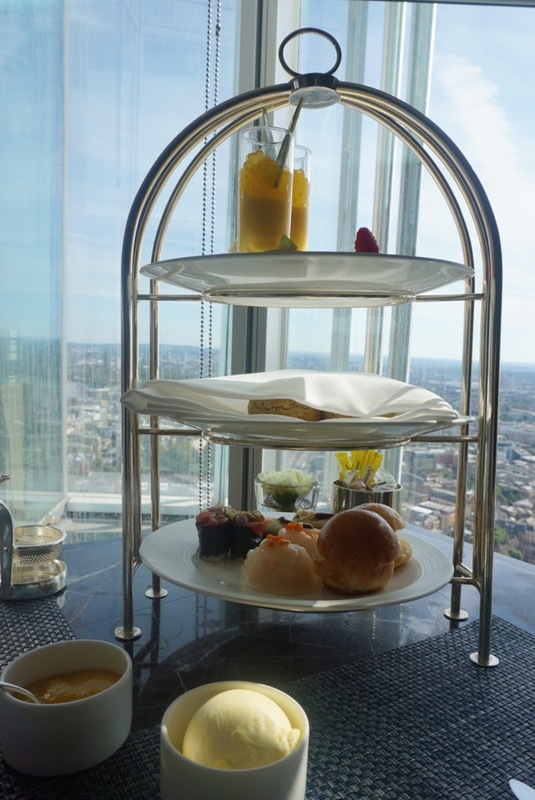 There is a choice of two different types of afternoon tea. 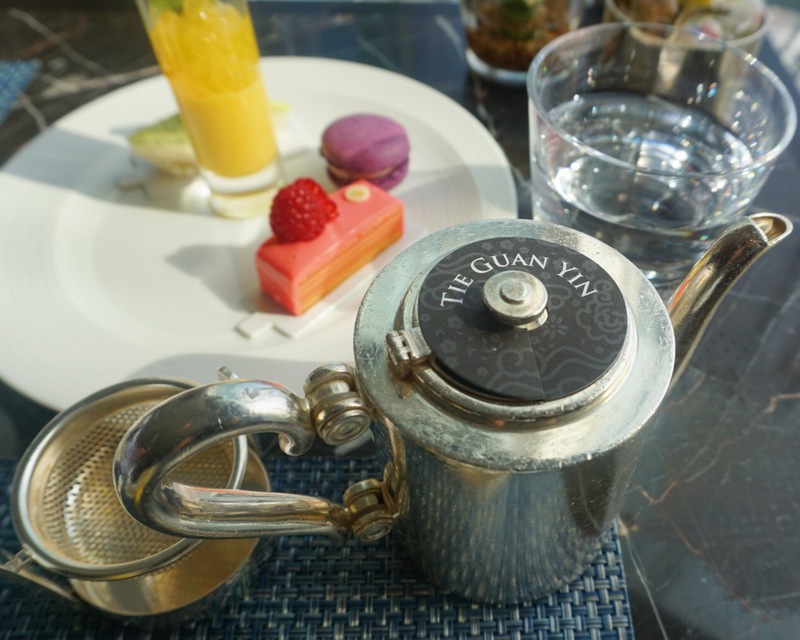 The Traditional, and South East Asian afternoon tea service (interesting- they just changed their online menu to be a Japanese afternoon tea which was not available when I went). I was wondering if there was a difference in serving method, and and asked our steward if there would be gaiwan service for the southeast Asian tea. My server had no idea what a gaiwan was. He looked at me and kept asking if that was a type of tea. Now I don't expect most places to know what a gaiwan is, but if you are a well known Asian hotel I'd hope you would at least be aware of what the vessel is for. Perhaps that is being too presumptuous? 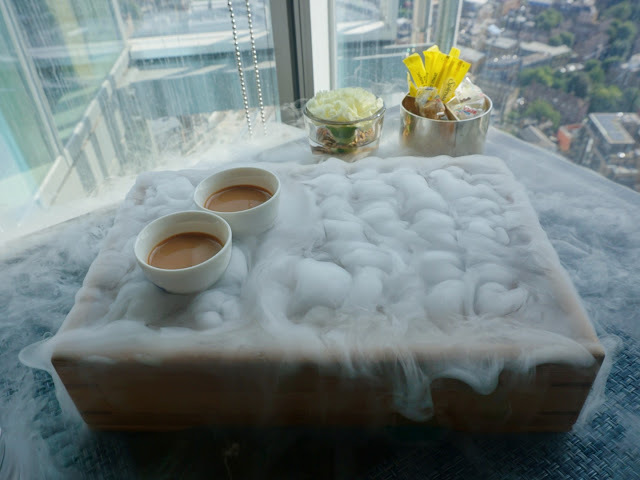 It was more surprising still when the 'amuse bouche' tea starter arrived on a gongfu bamboo tea tray with appropriately sized cups. But of course no gaiwan. I have to admit the amuse bouche was the best part of the tea experience here. Creamy, velvety teh tarik was served in the small gongfu cups on the bamboo tray. 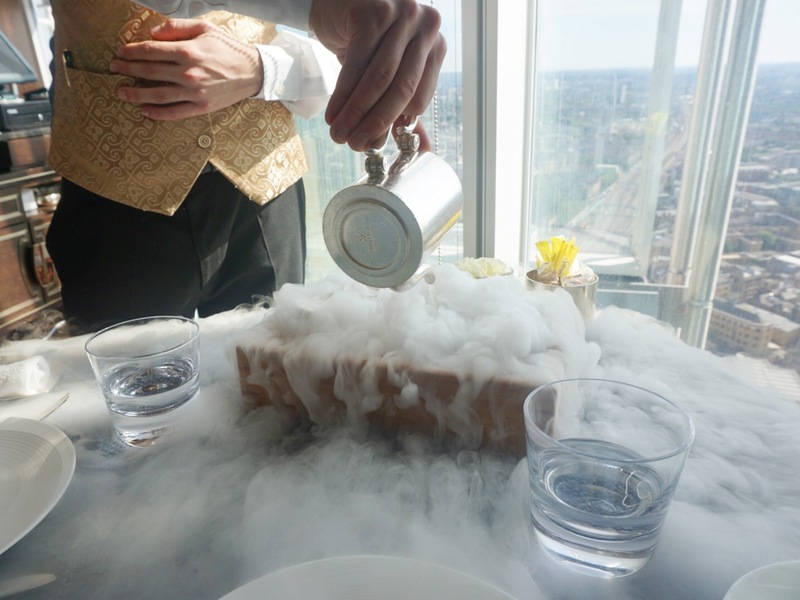 The steward then poured water on what must have been dry ice embedded in the tray and the table was engulfed in misty wonder. It was a fun way to start, even if it was nonsensical and a bit too theatrical. I've only had teh tarik a couple of times before, and I must say I'm hooked. It was served warm, and just felt like a hug of pure cashmere. We chose the Southeast Asian tea, which included various Vietnamese. Chinese, and Thai sweet and savory options. Unfortunately none of the food or pastry stood out for me. Everything was passably good, but not exactly outstanding. The memorable bite for me was the Chinese egg tart. I love Chinese custard tarts, and this one had the right amount of sweetness, crunch and flaky pastry. Many reviewers raved about the prawn dumplings which I found tasty, but far from memorable. The tea menu here looked promising, and had a few nice choices in each category. I noticed single estate black teas, a sheng pu'erh, as well as two white teas and a longjing. Three oolongs are offered, and I decided on the Tie Guan Yin to see if it would hold up to some of the better versions I've had. The tea service started out well. The Tie Guan Yin was steeped for the right amount of time, using an appropriate amount of leaves if you were draining the entire pot at once. 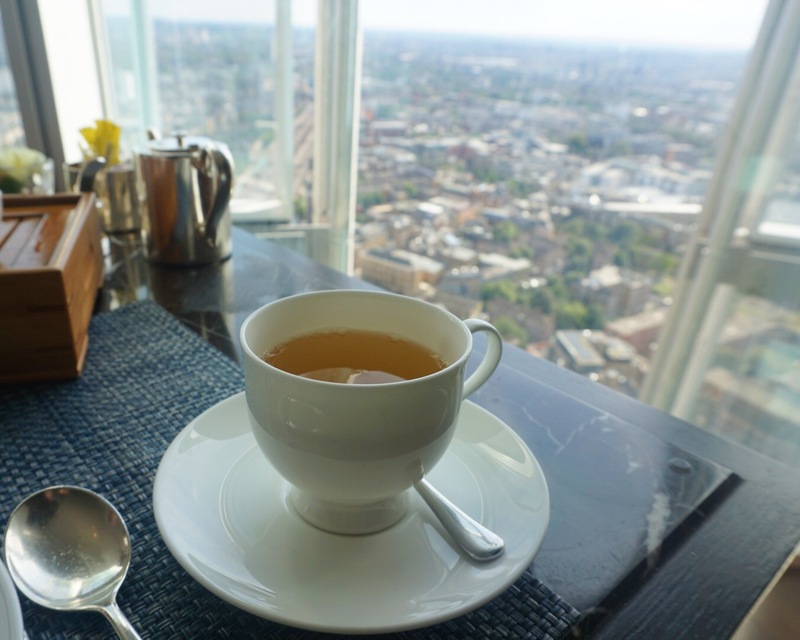 I enjoyed the fragrant sips while gazing out at the city of London. Things quickly went south however as the leaves were left in the teapot continuously steeping and producing a bitter, almost undrinkable brew. I asked for extra hot water but it couldn't save my pot of tea. Tea sadness. If this had been true gongfu style tea, all of the water would have been poured into our cups and nothing would have been left to steep. But since a traditional western teapot was used, each subsequent cup of tea was oversteeped. Even though the tea wasn't prepared properly, service in general was the right mix of attentive and unobtrusive. And of course, the view can't be beat. I don't think I'd be quick to recommend afternoon tea here, unless you're curious to try the East Asian afternoon tea experience. I'd rather seek out a place that specializes in gongfu tea service without the fancy bites of food. Given all of that, I'm grateful for the opportunity to gaze at such an impressive view in a luxe atmosphere while sipping tea. The teh tarik was delicious and I'm still wondering where I can get one of equal quality in NYC. Let's try the Malyasian spot in the Lower East Side; it might serve teh tarik. yes, yes! Let's do that!